In the middle of February, my dad texted me: “I might have found a ‘trip of a lifetime’ deal. If I could assure you it would not interfere with your internship, would you commit to traveling abroad with me July 22-30?” I immediately texted back my answer, “YES!” He wouldn’t tell me where we were (most likely) going, just in case things fell through, but he planned on booking the trip that day. I tried not to think about the places that it could possibly be, not wanting to get my hopes up too soon. Later that day, I found out that we were going to Egypt…EGYPT. Am I actually going to Egypt? Should I take a suitcase or try to get familiar with the new backpack? I’m going to wear the backpack right now. Maybe that will help me decide. I almost just walked outside with the backpack on and the neighbors would have seen me. I wonder how many people will be in our tour group. I don’t need to start packing yet. I could make piles of things that I won’t need until the trip. Stop stressing about what to wear. I guess I don’t need to take seventeen shirts on a ten-day trip. 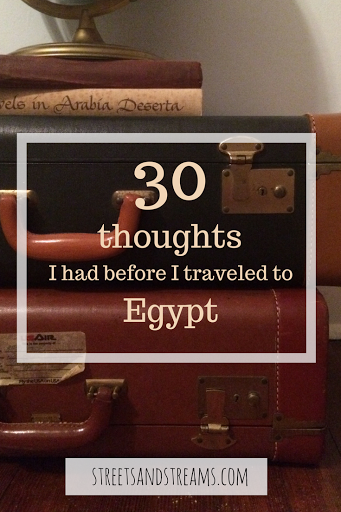 I have wanted to go to Egypt since third grade. I need to buy sunscreen and bug spray. 115 degrees is really hot. This time in three weeks, I will be in Egypt. I should make a packing list. I’m going to turn twenty in Egypt. Sneakers look touristy and American. The sand is going to be hot if I wear sandals to the pyramids. Remember not to wear a shirt or dress to the pyramids. Climbing up and down ladders in a skirt is a bad idea. I wish I remembered half the stuff I used to know about Ancient Egypt. I am going to go on an overnight Nile boat ride. I am going to the pyramids. I am going to the Valley of the Kings.